"An Ale with the Tang of the Old Sod"
Universal Tray and Sign Co.
Boston, Massachusetts ? Comments: Here it is - the mystery Tobin tray. Some think it is from Mass, some NYC? Some claim it is pre-pro, but Universal Tray and Sign Co. would indicate Post? Was it made specifically for a bar or restaurant? How come we can not find any information of this great tray? And what the heck does the slogan mean - "Tang of the Old Sod"? They don't get much better, especially if you have some Irish in you like I do (25%). 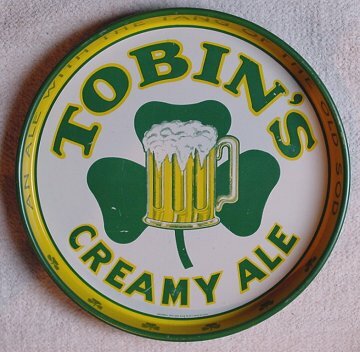 Great colors, great mug of beer, great fonts, great shamrock. All in all one of the best trays ever made in my estimation. And the mystery makes in all the more interesting and collectible. I feel very fortunate to have this awesome tray in my collection. Two references I checked have significantly lower value estimates than I do, but I think they are way low and if one of these went on eBay watch out!!! Other than a few scratches this baby is in great shape.